Phoenix, AZ—Okay, I have to confess that my two camera drones have brought out the child in me! I put one under my own tree last Christmas. I’m middle-aged but have become hopelessly hooked on these incredible things. I now own a DJI Phantom 2 and a Blade 350QX quad-copters that use those great GoPro cameras. For some unknown reason these multi-rotor camera drones have not caught the affection of women like they have men. I don’t understand this since women are generally more creative then men. I hope this changes because they have no clue what they’re missing. The popularity of the multi-rotor drones is exploding especially with photographers. They allow limitless perspectives of the subject mater sought to make or capture breathtaking images. They have starter drones on the substantially less-expensive end such as the Blade 200-QX that can help your child master the very important skills in controlling, operating and understanding this somewhat new technology. To be a successful camera drone owner & operator there are four things that must be part of your learning curve. First is learning the science and piloting of the device itself. Next is the understanding of cameras and video photography. After that, learning how to edit the video so that it is watchable becomes very important. Last but not least is story telling or writing ability, which is no small part of this process. The best way to describe this is to compare this process to making a TV news story or a blockbuster movie. If you’re not motivated, creative and competitive don’t bother with camera drones. There’s really no fun in using the camera drones if you can’t share your films with your friends and the world. Nobody will want to watch your videos unless they have that special sizzle. Drone photography has opened a new world that often can’t even be captured safely with conventional helicopters or fixed wing aircraft. The safety record of the camera drones is still unblemished but for a few careless owner/operators that have put their hand or fingers into the moving propellers. For these people putting Band-Aids in their flight box may be a good idea. Crashes into trees, buildings or other fixed objects are inevitable but most of the time the drone survives with little or no damage. A broken propeller or two are easily replaced. A pretty nice consumer drone with camera will cost between $1,200 and $3,000 but is worth every penny. The lucrative camera drone manufacturing industry is becoming fiercely competitive meaning the quality improves as the prices are dropping. An accomplished camera/drone operator can expect to see real career possibilities in many areas of business. Filmmaking, TV news, Surveying and Mapping businesses will all need drone/camera operators. Back to the idea of giving one of these gee wiz gizmos to you kid. A starter drone may be the best idea. If your child is really motivated, responsible and capable of handing the learning curve the real deal camera drone might just become the gift of a lifetime. Anyone getting a drone should learn to fly with an already accomplished drone operator. Trying to learn alone is a terrible idea. There are RC or remote control flying fields everywhere and there are folks there, flying that are only too willing to teach you some basics. Camera drone schools are also beginning to surface and that’s yet another professional opportunity. The drones are here to stay simply because they are both needed and wanted. 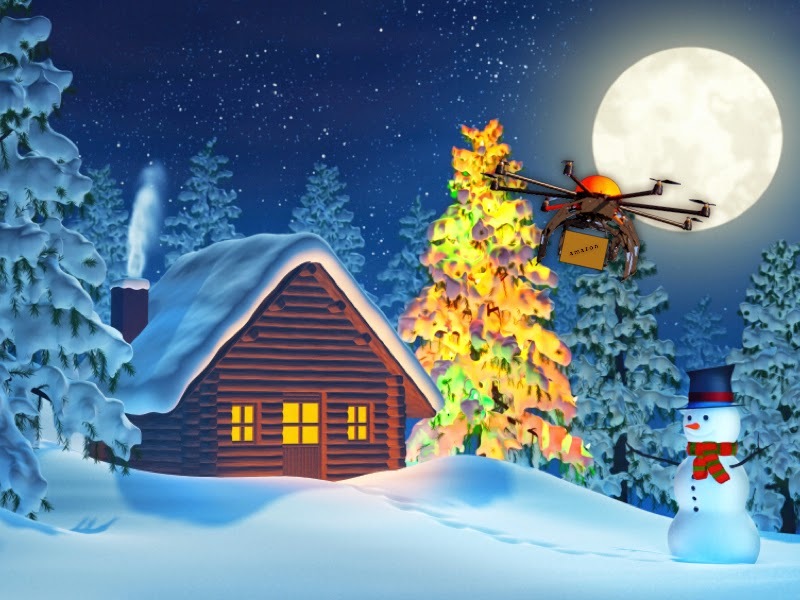 Now I want Santa Claus to put an advanced professional drone under my own tree this year! Give a drone a drone. A great gift idea! It would be neat if someone made one that sent real time video to the controller instead of having to retrieve the camera.